Melanie Phillips (born 4 June 1951) is a British journalist, author, and public commentator. She began on the left of the political spectrum, writing for The Guardian and New Statesman. During the 1990s, she came to identify with ideas more associated with the right and currently writes for The Times, The Jerusalem Post, and The Jewish Chronicle, covering political and social issues from a social conservative perspective. Phillips, quoting Irving Kristol, defines herself as a liberal who has "been mugged by reality". Phillips has appeared as a panellist on the BBC Radio 4 programme The Moral Maze and BBC One's Question Time. She was awarded the Orwell Prize for Journalism in 1996, while she was writing for The Observer. Her books include the memoir Guardian Angel: My Story, My Britain. Phillips was born in Hammersmith, the daughter of Mabel (née Cohen) and Alfred Phillips. Her family is Jewish and emigrated to Britain from Poland and Russia. According to her account, the name "Phillips" was imposed by British officials who were unable to pronounce her family's Polish name. She describes her family as "poor" people living as outsiders in an impoverished area of London, who "kept their heads down and tried to assimilate". Her father, Alfred, was a dress salesman, while her mother, Mabel, ran a children's clothes shop and both were committed Labour voters. She has stated that her father was "gentle, kind and innocent", an "overgrown child", and that "as my other parent he just wasn’t there", which taught her "how the absence of proper fathering could screw up a child for life". She was educated at Putney High School, a girls' fee-paying independent school in Putney, London. Later she read English at St Anne's College, Oxford. Phillips trained as a journalist on the Evening Echo, a local newspaper in Hemel Hempstead, as her probationary period in the provinces, then compulsory for the profession. After winning the Young Journalist of the Year award in 1976, she spent a short period at the New Society magazine, before joining The Guardian newspaper in 1977 and becoming its social services correspondent and social policy leader writer. She was named in 1984 as the paper's news editor, and was reported to have fainted on her first day. Her own opinion column began in 1987. As a writer for The Guardian in 1982 she defended the Labour Party at the time of the split with the Social Democratic Party. While working for The Guardian, Phillips was persuaded to write a play called Traitors by Julia Pascal, who directed it. It was performed at the Drill Hall from January 1986. The play was set at the time of the 1982 Lebanon War and centred around the moral dilemmas of a Jewish journalist who as political editor of a liberal magazine has to decide whether to veto an article written in anti-semitic tones, and also whether she is right to publish a leaked document about the Falklands War. The play was reviewed by John Peter in The Sunday Times as "a play of blistering intelligence and fearless moral questioning", although he considered it bordering on implausible. According to Phillips, writing in December 2017, it was the only positive review the play received. Phillips left The Guardian in 1993, saying that her relationship with the paper and its readers had become "like a really horrific family argument", and that she had seen the "reality" that "the west ha[d] lost its moral compass". She took her opinion column to The Guardian's sister-paper The Observer, then to The Sunday Times in 1998, before beginning her association with the tabloid Daily Mail in 2001. She also writes for The Jewish Chronicle and other periodicals. Since 2003, she has written a blog, once hosted by The Spectator, but after a disagreement and her resignation from the magazine in June 2011, it is now hosted on her own website. In September 2013, it emerged that her Mail column was to end, although according to Phillips, the newspaper wanted her to continue to write features and other articles for it. In 2013, she launched an e-book publishing company called emBooks, to promote her book, together with several others, and self-promotional merchandise to the US market. She currently writes for The Times. The BBC has said that Phillips "is regarded as one of the [British] media's leading right-wing voices" and a "controversial" columnist. Nick Cohen wrote in 2011 that she has become vilified by The Guardian. Phillips herself stated in 2006, during an interview with Jackie Ashley for the newspaper, that it often misrepresents her opinions. She is a staunch critic of Iran and has written and spoken frequently about the threat she perceives it to be, particularly if it were to obtain nuclear weapons. The Iranian regime, she writes, "has seen itself at war with the west ever since it came to power in 1979, and which has been involved in arguably every major terrorist atrocity against it". In her view, Iran's leaders are "religious fanatics" who are "impervious to reason" and who "would be happy" to bring about an apocalyptic end of days. Thus, "there is no alternative to force if it is to be stopped." She has drawn criticism for her hard-line approach from various commentators. She has said that she supports a two-state solution in theory but that it cannot work in practice, commenting: "I would have no problem with a Palestine that would live in peace alongside Israel ... I respond to the evidence of what is actually happening. Israel is being demonised ... If Israel were to leave the West Bank, it would turn Islamist overnight and become an Iranian proxy on Israel's doorstep. That is why I cannot support a state of Palestine." Phillips's criticisms of liberal Jews who disagree with her positions on Israel have been mocked or condemned by writers such as Alan Dershowitz, Rabbi David Goldberg, and Jonathan Freedland who criticised Phillips's labelling of Independent Jewish Voices, a group of liberal Jews, as "Jews For Genocide". Freedland wrote in The Jewish Chronicle: "Now, as it happens, I have multiple criticisms of IJV ... but even their most trenchant opponents must surely blanch at the notion that these critics of Israel and of Anglo-Jewish officialdom are somehow in favour of genocide—literally, eager to see the murder and eradication of the Jewish people ... it is an absurdity, one that drains the word 'genocide' of any meaning". Early in the presidency of Barack Obama, Phillips accused him of "adopting the agenda of the Islamist" and of being "firmly in the Islamists' camp". Shortly after Obama's re-election for a second term, Phillips said that "Four years ago, America put into the White House a sulky narcissist with an unbroken history of involvement in thuggish, corrupt, far-left, black power, Jew-bashing, west-hating politics". She warned that Obama would lead America into a "terrifying darkness". The Independent termed it "rather odd" and an "angry rant", which "sparked debate on Twitter". Phillips wrote in defence of president-elect Donald Trump on 14 November 2016: "Believing the smears they have created, the Trumpophobes then smear the public for voting for the man they have thus smeared. This, of course, is precisely why millions voted against the liberal establishment and for Trump, as well as for Brexit, in the first place". A year later she criticised Trump for retweeting videos from Britain First's leader Jayda Fransen, calling them "beyond stupid, reckless and reprehensible." She added that "Trump has given an enormous boost to a group that should be treated as totally beyond the pale. Although campaigning against Islamic extremism, intolerance and religious fascism is not just acceptable but necessary, some groups which do so are totally unacceptable because they themselves promote extremism, intolerance or fascism. Britain First is squarely in that category." Phillips expressed opposition to Irish independence, declaring on 7 March 2017 in her column in The Times, that the "most troublesome bits" of the UK are "showing signs of disuniting". For her, Scottish nationalism and Irish republicanism are cultural phenomena rooted in romanticism and myth", while Englishness "came to stand proxy for all the communities of the British Isles". In particular, she wrote "Ireland itself has a tenuous claim to nationhood" because the Irish Free State was only established in 1922. She denounced "attempts at secession by tribes" in Northern Ireland. The Irish Times said that the piece had met with objections from both unionists and republicans. The Irish ambassador to the United States, Daniel Mulhall, said on Twitter that the country's sovereignty is "based on strong sense of identity, distinctive culture & shared values and interests" and rejected her claim. She is ambivalent about the Northern Ireland peace process, stating that, on the one hand, it has strengthened the Union with Great Britain and saved lives, but that, on the other hand, it has rewarded terrorism, "undermined the rule of law", and exchanged bombs for "paramilitary, mafia-style control of some areas of Northern Ireland". In June 2014, in the context of Britain's first entirely secret trial for centuries, Phillips said that such legal proceedings are justifiable in certain circumstances. Phillips became a "scathing critic of modern Britain" which she regards as "a debauched and disorderly culture of instant gratification, with disintegrating families, feral children and violence, squalor and vulgarity on the streets". She has argued that the Conservative Party lost its way after the retirement of Margaret Thatcher. She also stated that the UK Independence Party is prepared to embody "truly conservative attitudes" and has attracted a sizeable protest vote, despite its "unsustainable spending policies". However, she has also offered tempered praise of Tony Blair's attitude to Islamic extremism, and she supported his policy of entering the Iraq War. In All Must Have Prizes, published in 1996, Phillips offered a critique of the British education system, saying that an egalitarian and non-competitive ethos (progressivism; multicultural education) had led to a catastrophic fall in standards. She criticised John Dewey's "disastrous influence". A subsequent paper said that "Phillips gets Dewey quite wrong," for example in claims that Dewey promoted ahistoric and cultureless education. Phillips criticized one academic paper—on primary-school children's constructions of British identity. Its authors responded with a follow-up study, showing that young adolescents, in common with their counterparts in primary schools, adopt a pluralist viewpoint with virtually no nationalist or racist comments. Phillips has commented on the politicisation of education, particularly at Aberystwyth University. In 2005, she said there was an "anti-Jewish witch-hunt going on in our seats of learning" with particular focus on Aberystwyth University, based on an anonymous student's testimony. In 2008, following further allegations (supported by documentary evidence) made by another anonymous student regarding the biased nature and reading list of a course on terrorism convened by politics lecturer Dr Marie Breen Smyth, as well as allegations by the same student regarding bias against Israel by Breen Smyth and her colleague Dr Richard Jackson, Phillips wrote to the Vice Chancellor of the University saying that Breen Smyth was a "subversive" who should not be allowed to teach. These accusations were denied by Breen Smyth. Phillips in 2011 said there is no "war on drugs" in Britain, rather a "refusal to enforce the law against drug use in a coherent, consistent, and effective manner". She sees the result as a lax attitude to drug use that helps perpetuate drug use. In 2010, she cited the US as an example of strict enforcement, stating "consumption of cocaine has fallen by 75 per cent in the U.S. over the past 20 years—suggesting that the American 'war on drugs' has been rather successful." She opposed the introduction of civil partnerships for gay couples in the UK, and has said that what she calls "the traditional family [...] has been relentlessly attacked by an alliance of feminists, gay rights activists, divorce lawyers and cultural Marxists who grasped that this was the surest way to destroy Western society." She has said that giving IVF fertility treatment to lesbians would "help destroy our understanding of human identity", and expressed her opinion that opposition to it represents "a fightback to save our civilisation". She said the UK government was brainwashing children by including references to gay people in lessons about censuses and population movement. Philips called it "an abuse of childhood", part of a "ruthless campaign by the gay rights lobby to destroy the very concept of normal sexual behaviour". She received the 'Bigot of the Year' award from gay equality organisation Stonewall in 2011. 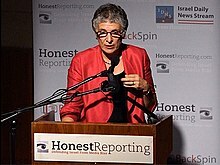 Melanie Phillips supported Andrew Wakefield, whose fraudulent work triggered the MMR vaccine controversy and led to his being struck off the medical register. Through numerous articles in the Daily Mail and The Spectator, Phillips championed Wakefield's claims while casting doubt on their rebuttal by scientists, doctors, and politicians. Her attacks on MMR attracted criticism from scientists and science writers. Phillips continued to support Wakefield after his research methods and motives began to attract serious scrutiny and criticism: "While Mr Wakefield is being subjected to a witch-hunt, and while the parents of the affected children are scandalously denied legal aid to pursue the court case which may well have finally brought to light the truth about MMR, those powerful people in the medical establishment are continuing to misrepresent the evidence." In May 2010, Andrew Wakefield was struck off the Medical Register for "serious professional misconduct", and is currently barred from practising medicine in the UK. Phillips's support of Wakefield's "findings" and her campaign against the MMR vaccine has been both widely noted, and credited for significantly undermining public trust in vaccines. 2 emissions are acidifying the oceans is a favourite of climate-change alarmists" and that "claims that coral reefs are doomed by ocean acidification are overplayed". 2, and numerous field experiments have found this deleterious to coral reefs. Phillips' published views on these topics have been challenged by leading scientists and academics, including John Krebs and Nicholas Stern. Phillips is married to Joshua Rozenberg, former legal affairs editor for the BBC. They have two children. America's Social Revolution, Civitas: Institute for the Study of Civil Society, 2001, ISBN 1-903386-15-2. Guardian Angel; My Journey from Leftism to Sanity, Bombardier Books, 2018. ^ a b c d e f Andy Beckett "The changing face of Melanie Phillips", The Guardian, 7 March 2003. ^ "Orwell Prize Melanie Phillips – Columnist, Daily Mail". The Orwell Prize. Retrieved 25 November 2011. ^ Hinsliff, Gaby (17 May 2013). "Guardian Angel: My Story, My Britain by Melanie Phillips – review". The Guardian. Retrieved 25 August 2013. ^ "Index entry". FreeBMD. ONS. Retrieved 22 June 2017. ^ a b Phillips, Melanie (26 December 2017). "Words I thought I'd never write: I'm a novelist". The Times. Retrieved 6 May 2018. ^ John Peter. "Amoral acquiescence". The Sunday Times. 26 January 1986. ^ Greenslade, Roy (28 June 2011). "Why Melanie Phillips quit The Spectator". The Guardian. London. Retrieved 4 May 2013. ^ "Goodbye, Melanie!". News Statesman (blog). 24 June 2011. Retrieved 4 May 2013. ^ Phillips, Melanie (16 June 2011). "My blog's new home". The Spectator. Archived from the original on 7 May 2012. Retrieved 17 December 2011. ^ Cooper, Charlie (5 May 2013). "Phillips launches 'Brand Melanie' as she tries to become the darling of the American right". The Independent. London. Retrieved 25 August 2013. ^ List of Panelists for Question Time, BBC website, 6 June 2007. ^ Cohen, Nick (6 December 2011). "A regiment of women monsterers". The Spectator. Archived from the original on 8 December 2011. Retrieved 17 December 2011. ^ a b Ashley, Jackie (16 June 2006). "The multicultural menace, anti-semitism and me". The Guardian. Retrieved 6 May 2018. ^ Phillips, Melanie (2 August 2006). "Hezbollah cells await Iran's orders". The Spectator. Retrieved 21 June 2013. ^ a b Phillips, Melanie (25 January 2012). "Why Iran will not 'come to its senses'". Mail Online. London. Retrieved 21 June 2013. ^ "The personal jihad of Melanie Phillips". 31 October 2009 – via The Guardian. ^ "What drove Melanie Phillips to the right?". 18 June 2010 – via The Guardian. ^ Glazov, Jamie (24 July 2009). "Alan Dershowitz vs. Melanie Phillips". FrontPage Magazine. Archived from the original on 24 May 2017. Retrieved 2 August 2009. ^ Dershowitz, Alan (9 July 2009). "A reply to Melanie Phillips". The Spectator. Press Holdings. Retrieved 10 May 2016. ^ Freedland, Jonathan (30 March 2007). "The danger of Melanie Phillips". The Jewish Chronicle. Archived from the original on 5 October 2011. Retrieved 3 August 2010. ^ Husain, Ed (31 October 2009). "The personal jihad of Melanie Phillips". The Guardian. London. ^ Davis, Laura (8 November 2012). "Melanie Phillips' rather odd reaction to Obama's win". The Independent. London. ^ "Melanie Phillips Claims Barack Obama's Reelection Brings World War Three 'A Lot Closer'". The Huffington Post UK. 8 November 2012. ^ Friedland, Elliot (30 November 2017). "Trump Retweets Posts by Group That Wants to Ban Islam". Clarion Project. Retrieved 16 March 2019. ^ D'Arcy, Ciarán (7 March 2017). "Furious response to column saying Ireland has 'tenuous claim to nationhood'". The Irish Times. Retrieved 6 May 2018. ^ "The Faustian pact of the Northern Ireland Peace Process" Archived 26 April 2014 at the Wayback Machine. Melanie Phillips. 23 June 2004. Retrieved 26 April 2014. ^ Jones, Owen (5 June 2014). "Britain's first secret trial: this way lies trouble". theguardian.com. Retrieved 9 June 2014. ^ Phillips, Melanie (9 June 2014). "Sometimes justice has to be done in secret". The Times. Retrieved 9 June 2014. ^ [ "Melanie Phillips: Would you buy a used manifesto promise from this lot?]". Archived from the original on 8 March 2013. ^ [ "Daily Mail: I know where the political common ground is, Dave. The question is, do you?]". Mail Online. ^ "Hysteria and irrationality over Iraq" Archived 26 April 2014 at the Wayback Machine. Melanie Phillips. 24 September 2004. Retrieved 26 April 2014 . ^ "UK Drugs Policy Commission responds to Melanie Phillips" Spectator.co.uk 19 April 2008[permanent dead link] Retrieved 6 February 2012. ^ Melanie Phillips (17 November 2011). "Drug legalisation? We need it like a hole in the head". melaniephillips.com. Archived from the original on 2 April 2015. Retrieved 13 April 2015. ^ Melanie Phillips (21 September 2010). "George Michael being jailed is pointless when our prisons are awash with drugs". Daily Mail Online. Retrieved 13 April 2015. ^ a b "Melanie Phillips's Articles " A fatherless law". Melaniephillips.com. Archived from the original on 9 June 2011. Retrieved 28 November 2009. ^ "Storm over Stonewall's Cardinal Keith O'Brien 'bigot' award". BBC News. 2 November 2012. ^ a b Helen Bedford & David Elliman (29 March 2003). "MMR: the onslaught continues". BMJ. Retrieved 13 November 2013. ^ Smith, Joan (12 September 2004). "The real MMR conspiracy". The Independent. London. Retrieved 13 November 2013. ^ Goldacre, Ben (2 November 2005). "The MMR sceptic who just doesn't understand science". The Guardian. Retrieved 13 November 2013. ^ Fitzpatrick, Michael (12 November 2005). "Why can't the Daily Mail eat humble pie over MMR?" (PDF). BMJ, Vol. 331. Archived from the original (PDF) on 14 November 2013. Retrieved 13 November 2013. ^ MMR : the facade cracks Archived 13 November 2013 at the Wayback Machine, published 7 February 2006, retrieved 13 November 2013. ^ Meikle, James; Boseley, Sarah (24 May 2010). "MMR row doctor Andrew Wakefield struck off register". The Guardian. London. Archived from the original on 27 May 2010. Retrieved 24 May 2010. ^ a b Paul A. Offit. Autism's False Prophets: Bad Science, Risky Medicine, and the Search for a Cure Columbia University Press, 2013: p. 56. ^ Malcolm Dean. Democracy Under Attack: How the Media Distort Policy and Politics The Policy Press, 2012: p. 371. ^ The IPCC defines "extremely likely" as indicating a probability of 95 to 100%, based on an expert assessment of all the available evidence. IPCC AR5 WG1 2013, Section: Summary for Policymakers (finalized version), page 4, footnote 2. ^ IPCC AR5 WG1 2013, Section: Summary for Policymakers (finalized version), Chapter: D.3 Detection and Attribution of Climate Change, page 17. ^ "The likely range of the human contribution to the global mean temperature increase over the period 1951–2010 is 1.1° to 1.4°F (0.6° to 0.8°C), and the central estimate of the observed warming of 1.2°F (0.65°C) lies within this range (high confidence). This translates to a likely human contribution of 93%–123% of the observed 1951–2010 change." Chapter 3: Detection and Attribution of Climate Change, Climate Science Special Report , U.S. Global Change Research Program. ^ Jacobson, M. Z. (2005). "Studying ocean acidification with conservative, stable numerical schemes for nonequilibrium air-ocean exchange and ocean equilibrium chemistry". Journal of Geophysical Research: Atmospheres. 110: D07302. Bibcode:2005JGRD..11007302J. doi:10.1029/2004JD005220. ^ "Report of the Ocean Acidification and Oxygen Working Group, International Council for Science's Scientific Committee on Ocean Research (SCOR) Biological Observatories Workshop" (PDF). ^ Mollica, Nathaniel R.; Guo, Weifu; Cohen, Anne L.; Huang, Kuo-Fang; Foster, Gavin L.; Donald, Hannah K.; Solow, Andrew R. (20 February 2018). "Ocean acidification affects coral growth by reducing skeletal density". Proceedings of the National Academy of Sciences. 115 (8): 1754–1759. Bibcode:2018PNAS..115.1754M. doi:10.1073/pnas.1712806115. ^ Albright, R.; Takeshita, T.; Koweek, D. A.; Ninokawa, A.; Wolfe, K.; Rivlin, T.; Nebuchina, Y.; Young, J.; Caldeira, K. (14 March 2018). "Carbon dioxide addition to coral reef waters suppresses net community calcification". Nature. 555 (7697): 516–519. Bibcode:2018Natur.555..516A. doi:10.1038/nature25968. ^ Carrington, Damian (21 April 2016). "Times's climate change coverage 'distorted' and 'poor quality'". The Guardian. UK. Retrieved 25 May 2018. ^ Phillips, Sara (21 April 2016). "Leading scientists urge UK newspaper The Times to improve 'sub-standard' climate reporting". ABC News. Australia. Retrieved 25 May 2018. ^ "Joshua Rozenberg". Noel Gay. Archived from the original on 19 July 2011. Retrieved 11 June 2010. ^ Teller, Neville (14 March 2019). "A journalist's journey The transformational autobiography of Melanie Phillips (bok review)". Jerusalem Report. Retrieved 19 March 2019.